Archie Campbell was a country musician and a star of the Grand Ole Opry and the long running Nashville TV Show "Hee Haw." He was born in 1914 in Bulls Gap, TN (A small town with an important railroad history in the corner of Hawkins Co., TN). 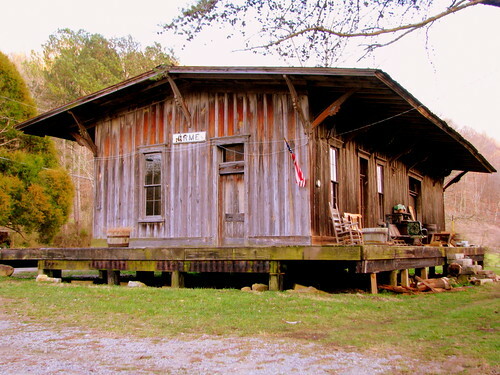 Next door to this homestead is the Bulls Gap city hall and the Archie Campbell Museum. Highway US11 in the area was renamed Archie Campbell Highway. Every Labor Day Weekend, Bulls Gap has an Archie Cambell celebration. I seem to recall seeing more than one out there. 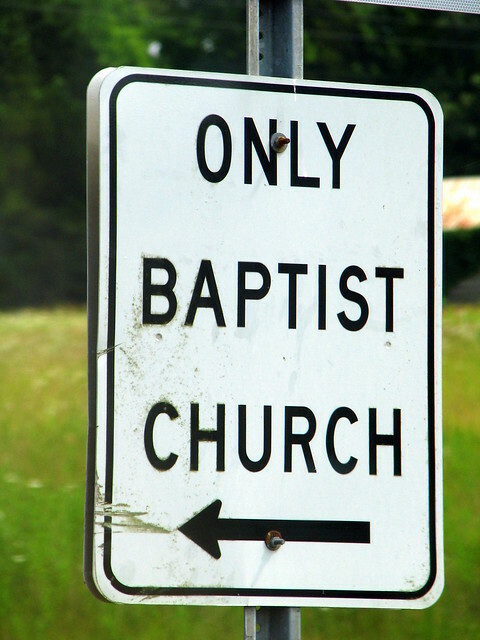 Actually, this sign is pointing to the Baptist Church in the town of Only, TN. Only is a small town in Hickman County near where highway TN50 crosses the Harpeth River and has an intersection with Interstate 40. 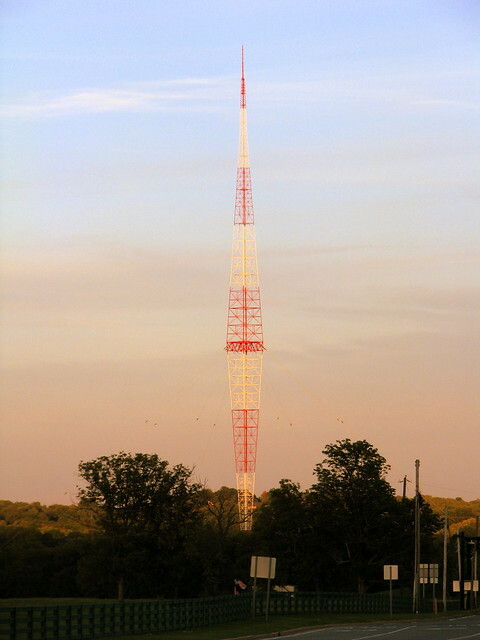 This is the famous WSM 650 AM 50,000 Watt radio transmitter just off Interstate 65 and Concord Road south of Nashville in Brentwood, TN. When it was constructed in 1932, it was the tallest radio tower in America. In fact, at the time, you could purchade a post card that stated its height at 878 feet and them pointed out it was 323 feet taller than the Washington Monument. This tower turned WSM into the radio blowtorch which helped much of America be able to hear the Grand Ole Opry and cement Nashville's place as the home of Country Music. WSM remains the only "clear channel" in the U.S. to still play music. From a technical perspctive, this is a dual cantilevered center guyed tower, a.k.a a diamond antenna. It was made by Blaw-Knox company of Pittsburgh who went on to make similar towers until going out of business in the 50s. This tower still is the tallest Blaw-Knox tower in the U.S. but today it is only 808 ft. tall. SeeMidTN.com is 1 year old! I'd like to take a moment and thank everyone who comes by to visit. I would be doing this for myself even if nobody stopped by, but in the first year there have been over 3000 visits to the blog. Over time, I will continue to add more galleries to the Extended Galleries section of the website. I have uploaded the historical markers for the counties that have the most, but other counties will be uploaded over the next few months. I then plan on added other categories, such as Post Offices, highway signs, buildings and architecture, trains and more trains, etc. Is there something you want to see? Send me a message or leave a comment and I'll see what I can do. One bad habit of mine is I get books about Middle Tennessee and the surrounding areas faster than I can read them. I need to let you know what the good ones are. I have a link in the top right corner called "Recommended Books" and from there, you can find the bookstore where you can get the books from Amazon. Many of these books are out of print and tend to not show up in searches. Some of these books provide great information, can be hard to find, but aren't necessarily expensive. 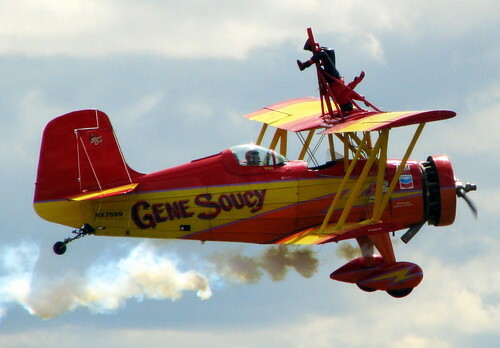 If you haven't heard the news yet, the Airshow is coming back to Smyrna this year. The last Smyrna airshow was in 2008, highlighted by the Blue Angels. They tend to take a year off after each show, which they did in 2009. In 2010, the organizers were unable to secure either the Blue Angels or the Thunderbirds, and didn't want to put on a show unless they had one of the nation's premier groups. Now, for 2011, the Thunderbirds. Train Tracks are still present (I'm practically on them to take this picture) but I'm not sure if trains run these tracks anymore. 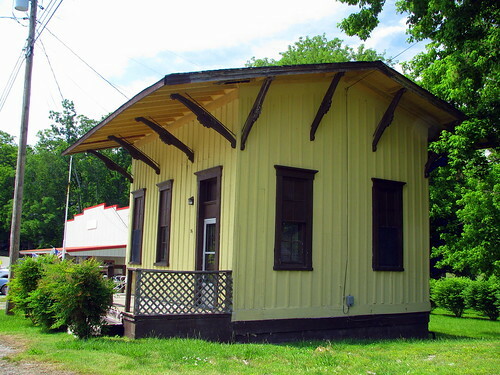 According to the owner of the antique store in the background, this small depot has been converted into a small apartment. Located on TN287. Here's an old photo of the depot before it was repainted. This photo was posted to flickr by Kenton Dickerson. 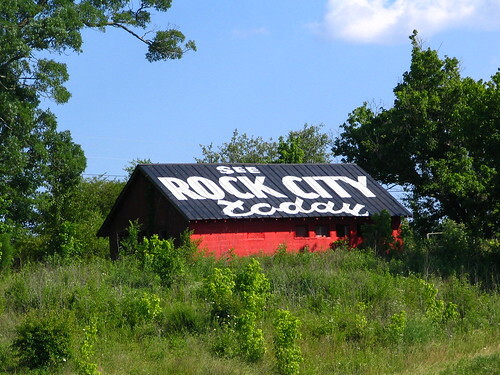 This "Rock City Barn" is located on Interstate 24 just before crossing the Tennessee River in Marion County, TN. 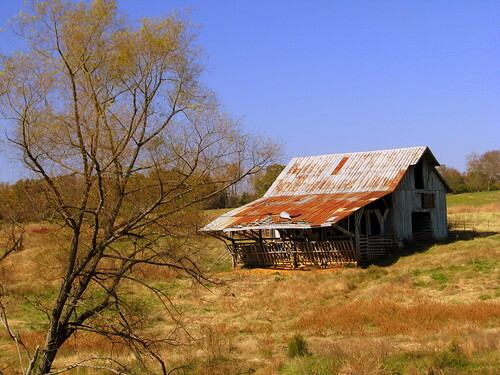 Perhaps there is nobody on Flickr who goes out of his or her way to look for the Rock City Barns as much as I do. That makes the fact that I had driven right by this one a dozen times without noticing it somewhat surprizing. there is a place where the eastbound and westbound lanes split apart. Some lucky person owns the land between the lanes and uses it to advertise a tractor dealership, so there are perfectly parked rows of tractors. Everytime I drove through there, I would notice the tractors and miss the Rock City ad on the building up the hill to the right. If you drive the other direction, you see a fireworks store between the lanes. 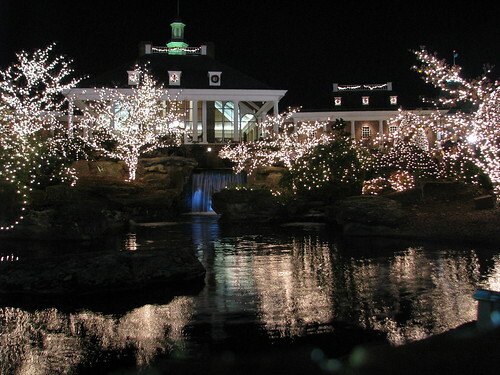 The Coffee County courthouse in the town square or Manchester, TN has a Christmas light show set to music. I have uploaded five videos of the songs from their light show. This song is Wizards in Winter by Trans-Siberian Orchestra, which seems to be the song of choice for Christmas Light Displays on YouTube. I apologize for the audio quality. This is still a town square and cars were driving by. I tried to pick from my recordings the ones with the least amount of traffic. Also, the speaker playing the music is coming from inside the courthouse, I think. When Union Station opened in Nashville in 1900, visitors were amazed at the impressiveness of the station, and in particular the artwork in the lobby. 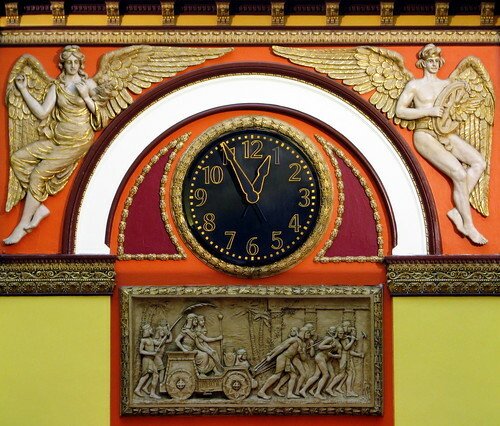 On each end of the lobby is a massive clock, with a figure on either side and above a bas-relief sculpture. Shown here are two figures, one female and one male, angels representing time and progress. The sculpture is an Egyptian pharoah in a chariot. The last trian pulled up at Union Station in the 70's. In the late 80's the station was opened as a hotel, and in 2007 the entire lobby underwent an extensive renovation, which involved cleaning the sculpture and polishing the gold leaf. 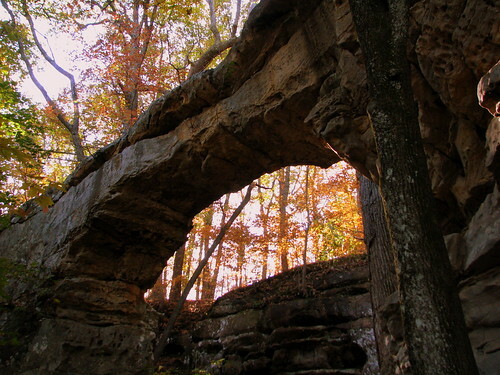 Sewanee Natural Bridge in Franklin County, Tennessee, is a 25 feet (8 m) high natural sandstone arch with a span of 50 feet (15 m). It is essentially a giant sinkhole partially eroded to form a large stone bridge. A wet weather spring located behind the bridge in a rock cave probably contributed to the erosion forming the arch. It is called the Sewanee Natural Bridge as it was once owned by the University of the South in Sewanee, Tennessee. It is a 3 acre (12,000 m²) designated state natural area. 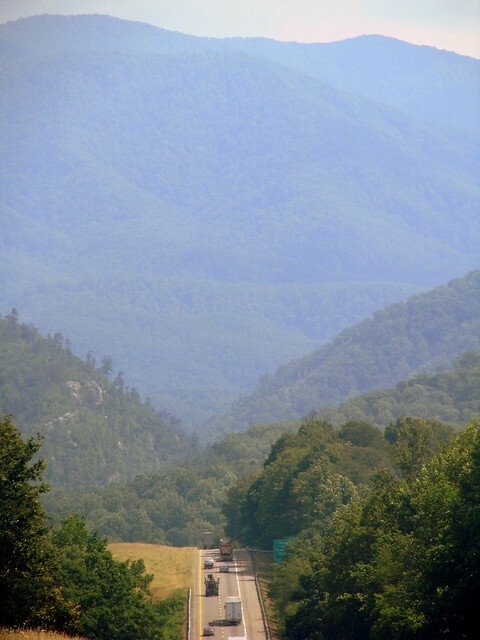 Today, the Area is considered part of the South Cumberland State Park. You can't get to the bottom if you are afraid of heights as you have to walk over the bridge, which is about 3 ft. wide, to get to the other side where you can scale down it. To get here, you'd follow the signs iff highway TN56. This is the 4th Courthouse to be built in Clarksville. 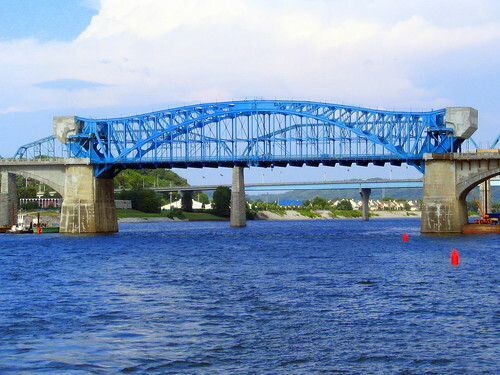 It was constructed in 1879 for $100,000, and was placed in a location that was away from the town square. 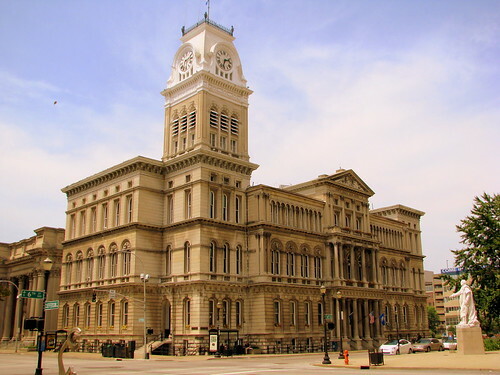 It was designed with Italianate and Victorian elements in a classical style and is topped with a tall clock tower. This courthouse was built after a devestating fire turned the previous courthouse and much of the city was turned to rubble. On April 13, 1878, the fire started, which was aided by wind as well as the town's only fire engine broke down early. This fire wasn't fully out until another fire engine was sent by train from Nashville. On March 12, 1900 another fire almost destroyed this courthouse. 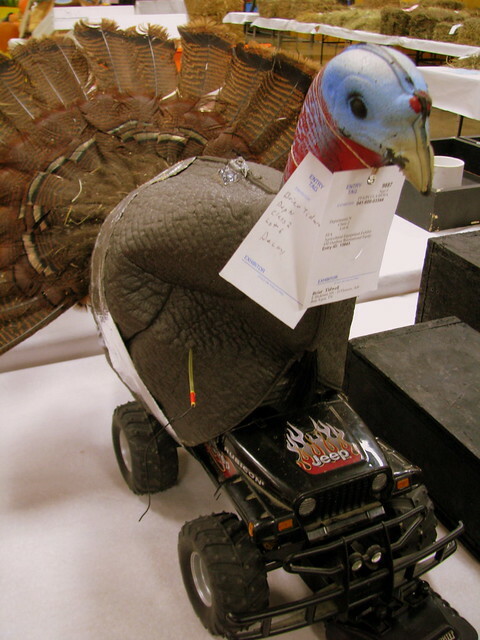 It was believed to have started in the southeast section of a flue in the office of the Circuit Court Clerk. By now, the town had learned its lesson and had better fire-fighting practices in place, which saved the building. Steel girders and beams in the ceiling were anchored in cement keeping the lower floor intact, although the roof and tower collapsed. After inspection, the remnants were deemed structurally sound and the building was rebuilt with a new clock and the soaring bronze eagle was reinstated in his aerie on the top. On March 20, 1976, heavy winds caused the eagle on top to be blown off and it was feared to be lost but eventually found and reattached. Disaster struck again on Jan. 22, 1999, when an F4 tornado struck downtown, crippling the courthouse and causing $74 million damage to the city. Sections of the roof and spires were ripped away, the clock tower was leveled and the east wall was collapsed. The eagle was never found. 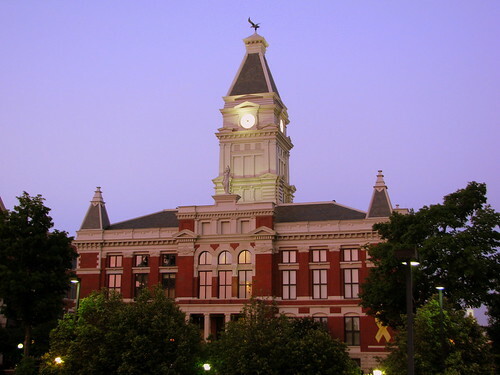 After considering building a new courthouse, city leaders decided to rebuild this one again. The exterior was rebuilt to look just like it had been and the interior was redesigned. A replicated tower and eagle was again placed on top. 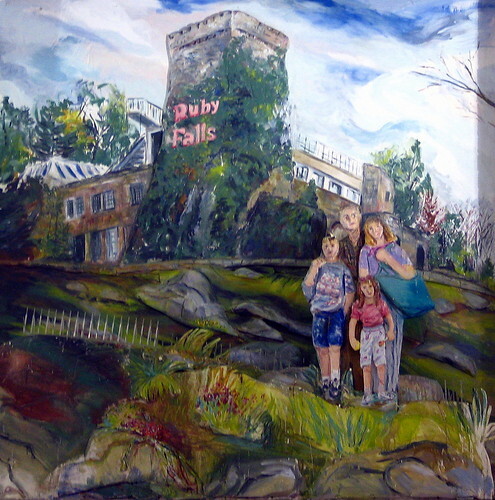 All repairs were completed in the fall of 2002. How long will it last this time? Clarksville has a very storied past of disasters with fires, tornados and floods. At least the May 2010 couldn't reach it. He called together the priests and Levites and said to them, "Go to the towns of Judah and collect the money due annually from all Israel, to repair the temple of your God. Do it now." But the Levites did not act at once. 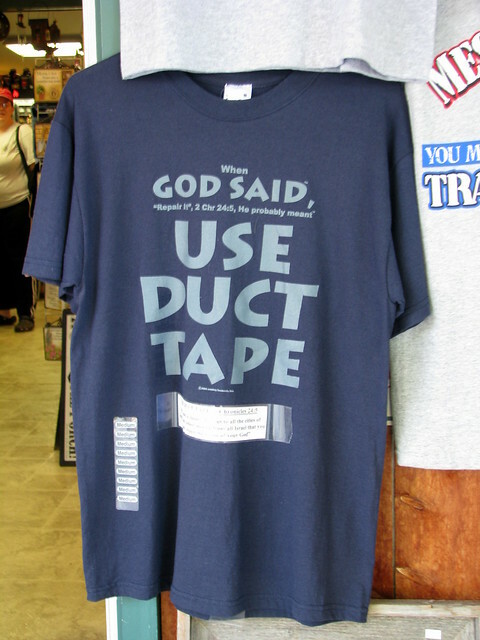 I'ts not too late to drive to Lynchburg and get this for your hard-to-shop-for relative as a Christmas present. This is on an old but still drivable strech of the Dixie Highway, which later became US41. When traffic demands became higher, a newer Joe Frank Harris Pkwy was made parallel to the old Dixie Highway, but the stretch of Dixie Highway is still drivable. 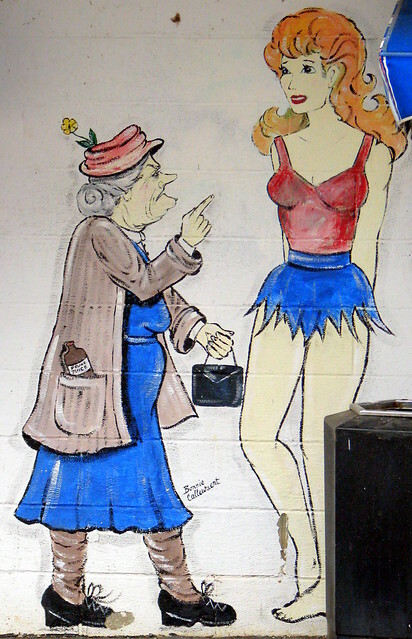 As for the barn, it's tough to tell exactly how many decades ago this was painted, but it must have been a long time ago. 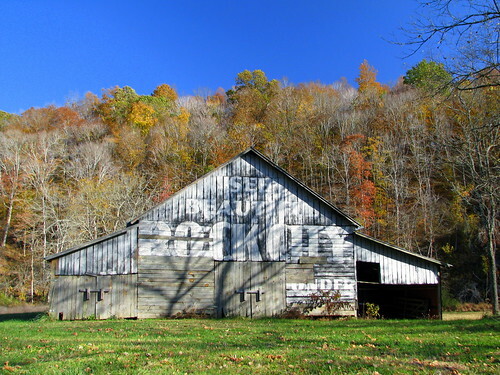 Perhaps the only reason any of the letters on the side of the barn survived is because the barn owner added the extension to the barn, keeping the paint from the elements. If you look at the barn from the side, you can see the word Beautiful in script and then a large block ROCK CITY. Also, if you look closely at the roof of the barn, I can tell that it used to have part of the message too (The paint colors cause different shades of rust) but It is unreadable now. This is located just north of Adairsville, GA in Bartow County about 1000 feet south of the Gordon County line. 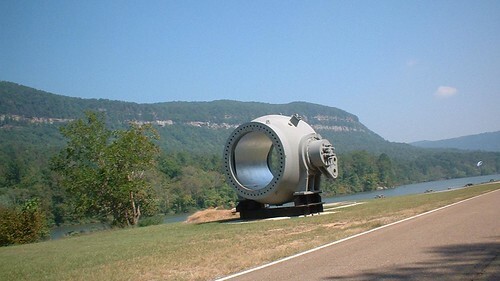 This...Whatever this is...can be seen while driving through the Raccoon Mountain TVA area. 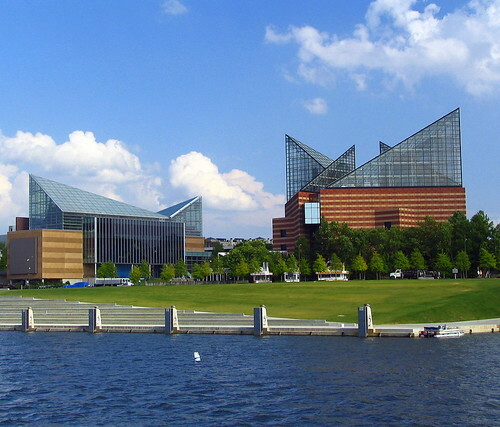 The Tennessee River is in the background. Driving up this road will eventually take us to the observation point which gives a good view of Lookout Mountain and Chattanooga Below. 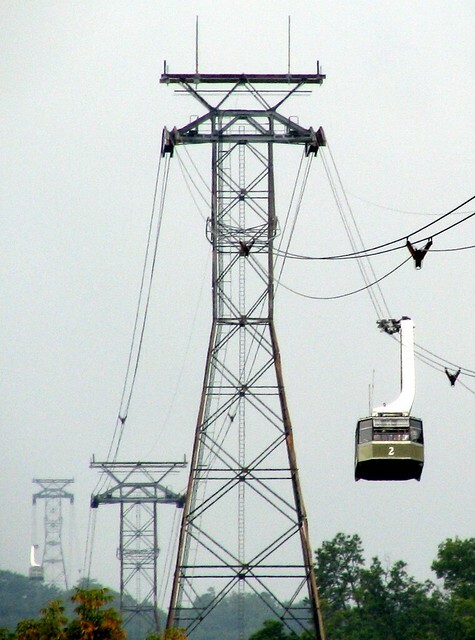 This street also takes us to the Raccoon Mountain reservoir which is part of the TVA power system. However its just odd to see this machinery on the side of the road in an otherwise scenic setting. Located in the Public Square in front of the Davidson County Courthose and Public Building. I like the blue light theme. This springhouse was on land occupied by Governor Aaron V. Brown (Gov of TN in the 1840s) a historical marker says: "Melrose. Former Home of Gov. Aaron V. Brown. The Confederate Works ran 200 yards south of the residence. Thence turned west so as to pass in front of Berry Home." 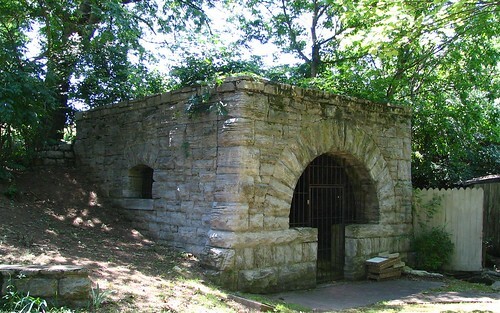 In the 1960's Lillian and George Forehand bought the property, cleaned up this Springhouse, converted the Gov. 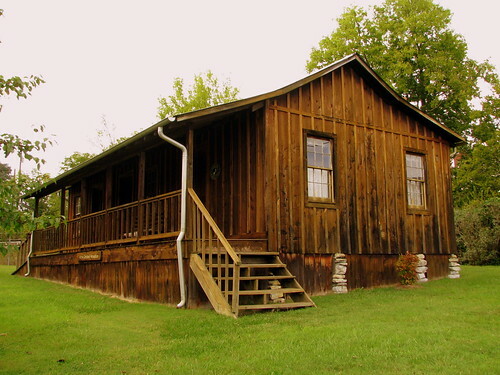 Brown's residence into a newer property, had two historic cabins moved here, contructed a pond that ducks and bass enjoy and posted historical markers for the buildings. The marker here reads: "HOSPITAL WATER SOURCE. 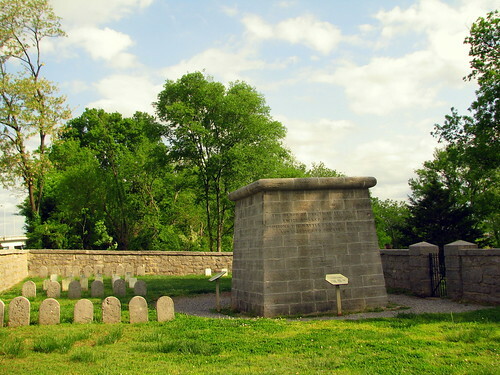 Because of the Generous Water Supply available from this spring, the area around it was selected as a hospital site for treatment of soldiers wounded in the Battle of Nashville which took place during the War Between the States." This property was soon completely surrounded by the Woodlawn Funeral Home and is now in the middle of that cemetery. Mr. Forehand passed away a few years ago. The last I heard, Mrs. Forehand recently moved to an assisted living facility, but comes back almost daily to feed her cats which still live here. 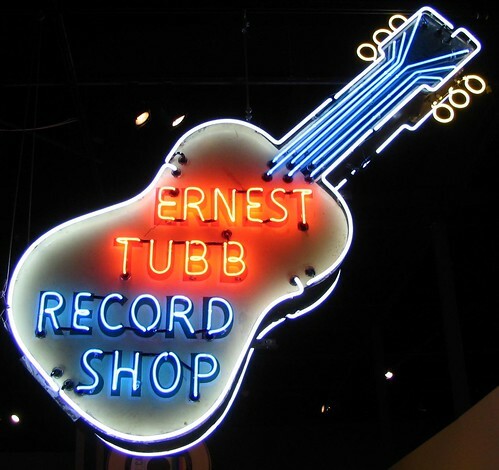 This neon sign has something in common with yesterday's Walter Nipper Nashville Catfish. 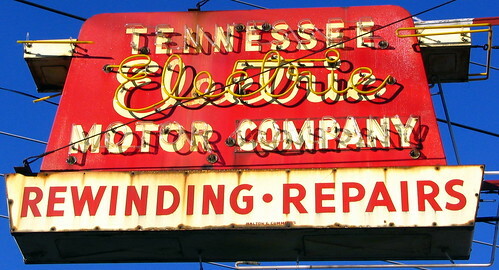 Sadly, this is another neon sign that is now gone, as the new Nashville convention center is going to be located where this building was. 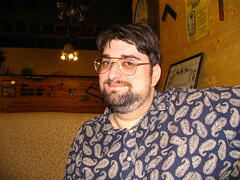 This photo was taken in 2007. The Company part is replacing an older word. According to their website at the time, they had been around since 1936. Rewinding? Like what? VHS Tapes? Odometers? The Nashville Fish sign of Walter Nipper's Sporting Goods store is sadly not anymore on display at the store's location at 8th Ave in downtown Nashville. 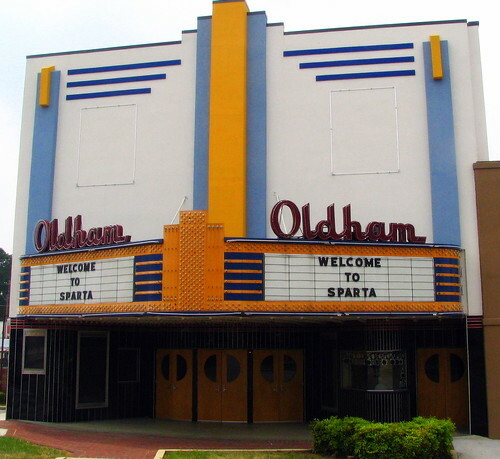 This is what it looked like in 2007. 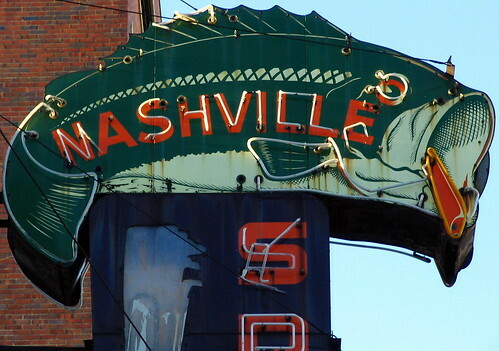 If you didn't notice, the A in Nashville fell off and is stuck to the S. I saw a picture of this sign in a book printed in 2001 and the A was in the same place. Wild speculation....98 Tornado did it? 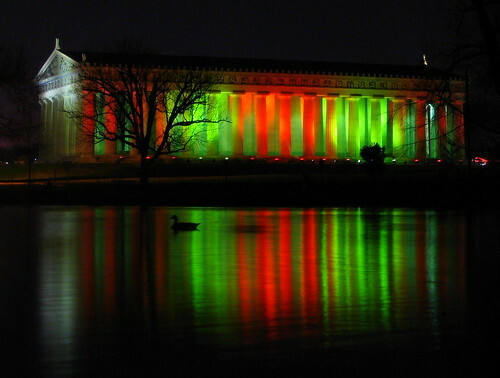 For Christmas, the Parthenon is illuminated with red and green lights, which is seen here reflecting into Lake Watauga. This picture is a 6 second exposure. During this time, two ducks were swimming in the water, one remaining still and the other swimming. You might see the still one below the tree, with the moving one to its right. 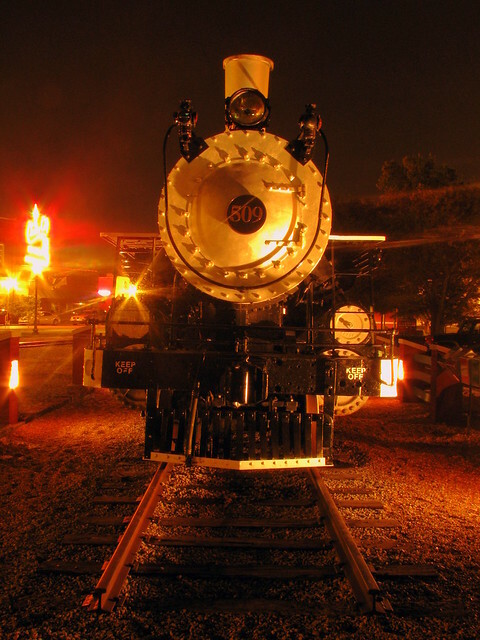 The Tennessee Central Depot in the heart of Cookeville has been turned into a museum, and is known as "The Crown Jewel of the Tennessee Central Railway." Several train cars are outside and part of the museum, led by Locomotive. As a side note, this reminds me of the song "The Railroad Comes through the middle of the house" as one of the lines is: Here comes the 5:09. The Terminal Station was erected in 1908, with its centerpiece - a magnificent dome - that rose majestically over the concourse. Built of steel and concrete and buttressed by huge brick arches, the dome rested on four steel supports 75 feet apart. Suspended from the ceiling were four brass chandeliers, each with 40 lights circling an 18-inch opal globe. 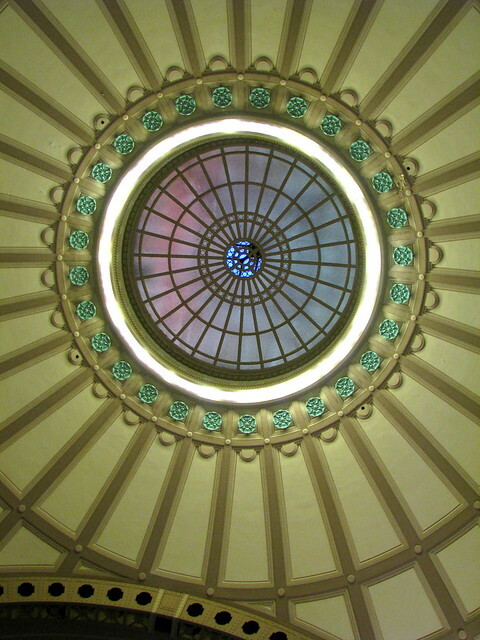 From an architectural standpoint, this dome over the entire 68 x 82 foot general waiting rooms was the most attractive design feature of its time. It was on the underside of this dome, the part in view above the waiting room, that the only attempt to decorate in colors was made -- artistic plaster embellishments of heraldic emblems, which are now fully restored. The dome was truly lavish and beautiful in its different prismatic colors, especially when lighted at night. This photo was taken near dusk on a clear night. 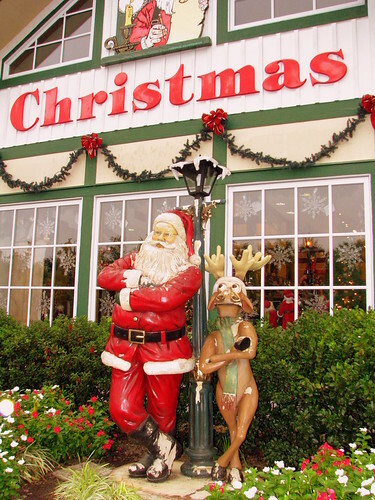 There's a open year round Christmas store at the Apple Barn complex in Pigeon Forge, TN. Santa is down with that, along with a member of his reindeer posse. 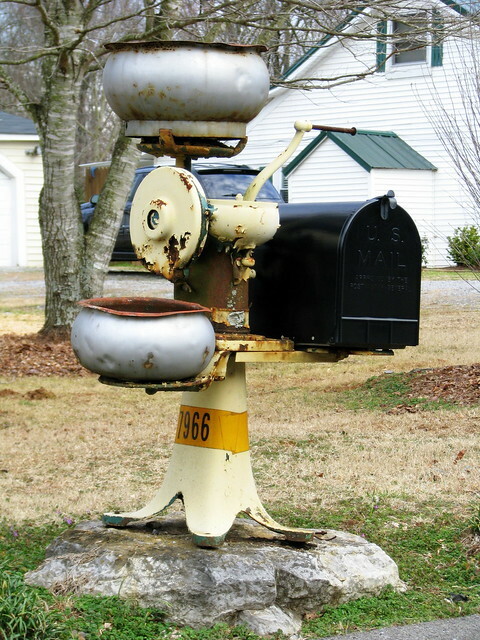 I found this when driving the really off the beaten path roads of rural Rutherford county. Someone guessed that's a cream separator, but I wouldn't know. Established 1928, but the building was built in 1915. 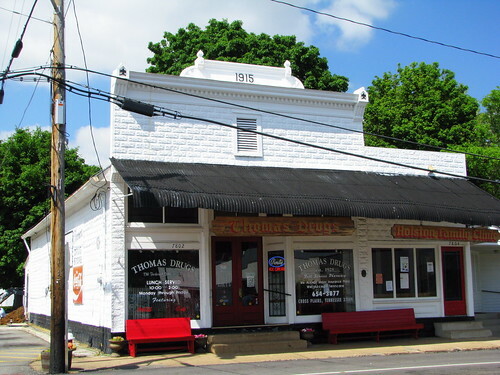 In the small old town of Cross Plains, TN, where two old stagecoach highways crossed. This building is now onthe National register of Historic Places and is best known now for still having an authentic Soda fountain. 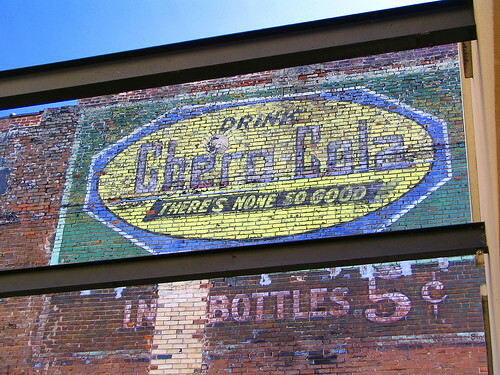 If you drive on Interstate 65 through the area, the highway sign mentions the Historic Soda Fountain. 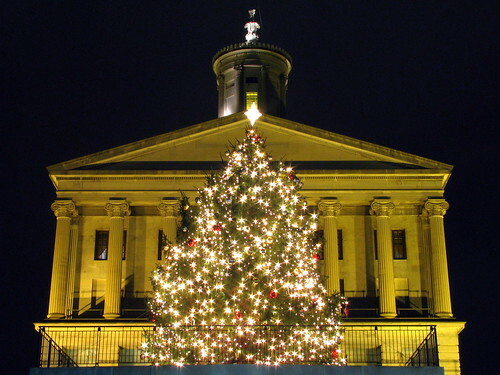 Located in the heart of Elizabethton, TN, in front of the 1861 Folsom House is a 78 foot tall Fraser Fir Tree. The tree was planted by Henderson Folsom, who was a Confederate Major in the Civil War. 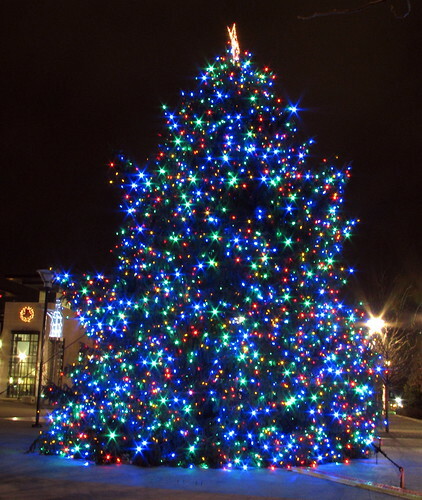 Since a typical Fraser Fir grows to about 40-50 feet, townsfolk wondered just how special their 78" fraser fir was. After searching for similar trees, this tree was declared the tallest Fraser Fir tree in the world. Unfortunately, a taller Fraser Fir was eventually found. 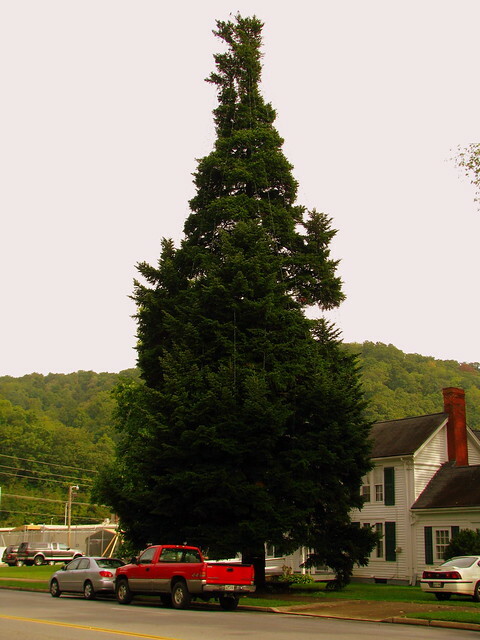 Undaunted by this discovery, the townsfolk strung some Christmas Lights on it in 1988 and declared this to be the official Elizabethton Christmas Tree. Now, they can claim this is the tallest decorated Fraser Fir tree in the world! The Craigmiles famly is an important one in Cleveland, TN. In 1864, tragedy befell the family when young Nina Craigmiles went on a buggy ride with her grandfather. She was steering the horses when she lost control of them. The horses ran into an oncoming train, killing Nina instantly. 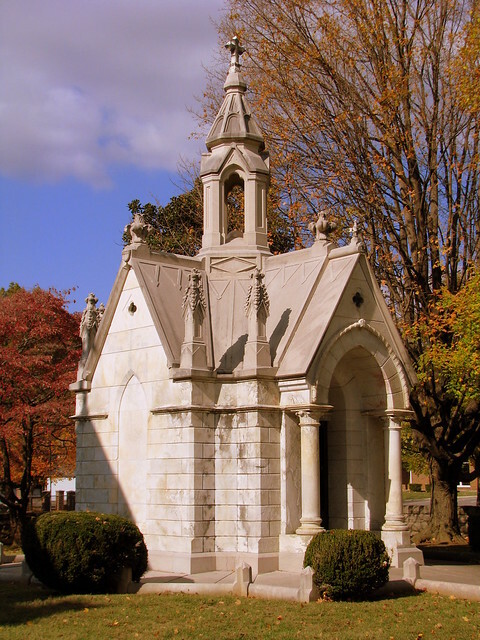 Nina's father John Craigmiles arranged with the local Episcopal congregation to build them a church building in her honor along with this mausoleum at the rear of the property. The Mausoleum was built using fancy Italian marble. The walls are four feet thick and the entire memorial is 37 feet tall.The marble spire is topped with a cross. On the inside is a marble sarcophagus stnding in the center, surrounded by six shelves. Tragedy continued to befall the rest of the family. First, another child was born but died very soon after childbirth. Then, John Cragmiles fell on an icy street and soon thereafter died of blood poisoning. Finally, the mom Adelia was killed when she was hit by a car. Each family member was buried here. Now, for the "bleeding" part. Townspeople soon began to notice after Nina was buried here that a red substance over time begane to eminate from the marble. 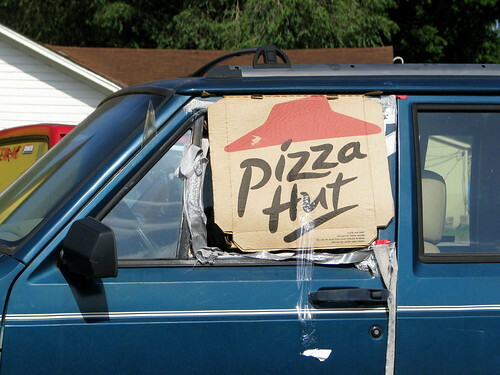 It would be cleaned only to reappear later. According to legend, after each death in the family, the redness got more intense. Some of those red streaks can be seen in the picture, but you probably can't see it here unless you click on the image and view it large size. There is a logical explanaiton, albeit boring if you like the haunted tales. Italian marble can contain small traces of lead, and lead will turn red over time when exposed to the elements. One of the old houses on Rutledge Hill, located on the corner of Rutledge & Lea. 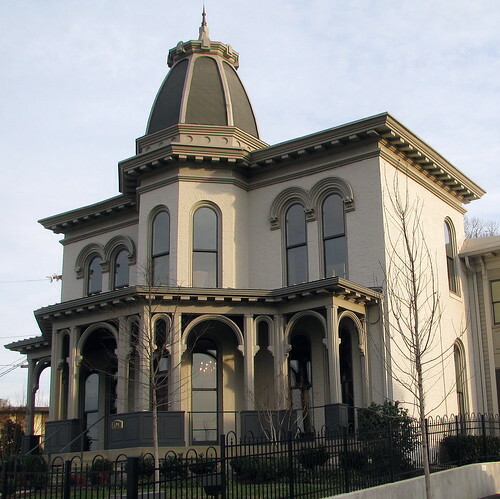 It was originally the home of Henry Middleton Rutledge and Septima Sexta Middleton Rutledge. They were 1st cousins and children of 2 of the signers of the Declaration of Independence, Edward Rutledge and Arthur Middleton. 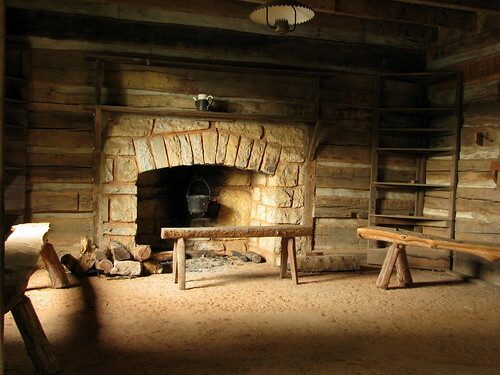 The original portion of the home was built in 1814 but much of it burned during the civil war. The front of the home, shown here, is a newer addition. Another owner of the house was Edmund Baxter, brother of railroad magnate Jere Baxter. Now, the house is used by the law firm of Blackburn & McCune. It's good to know that Opryland Hotel is back in business again. 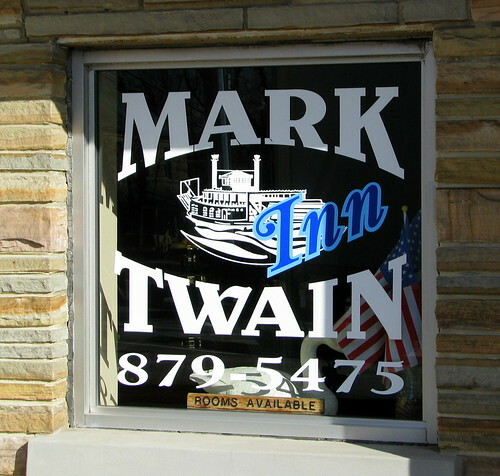 It's now been about three weeks since it reopened following the May flood damage. 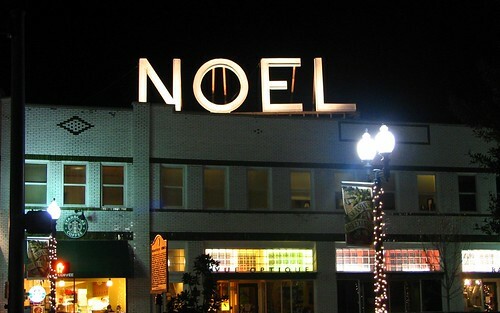 It's about time for me to get back out there and see what 2010 decorations they have and what else is new for 2010. 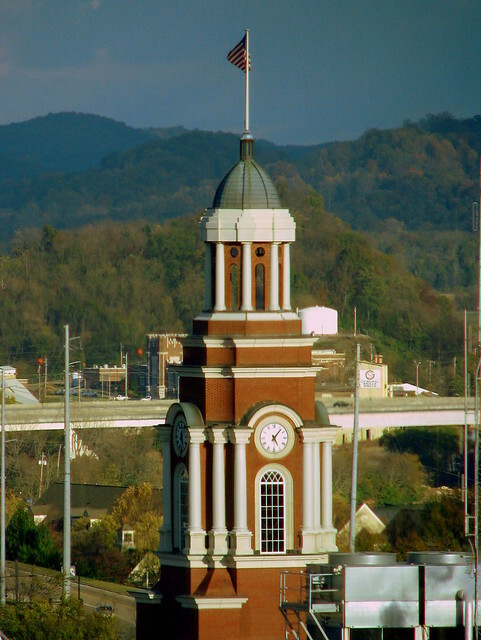 Williamsport is a tiny little community is Maury County on Highway 50 between Columbia and Centerville. 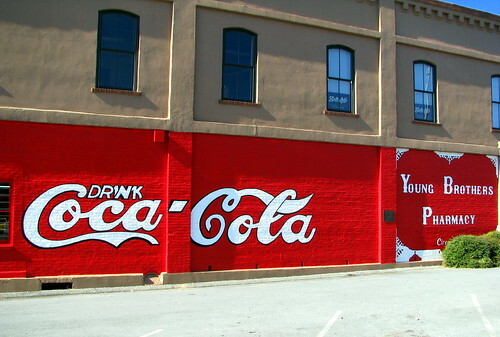 The small post office is also a convenience store and has three paintings on the side of the building. They are signed by Bonnie Callewaert. 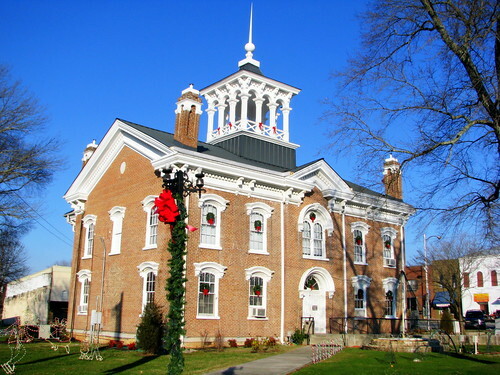 This Courthouse in Manchester, TN was built in 1871 in an Italianate Style. Every year, it is nicely decorated for Christmas.